My contribution to the office holiday party this year was none other than peanut butter and nutella cookies. If you don't know what nutella is, you should. Just go buy some, you'll love it, I promise. This all started when I saw a recipe somewhere for peanut butter and nutella cookies but they were no-bake and frankly, did not look too tasty. This got the idea in my head. What could possibly go better? So I got to thinking, nutella is not so different from peanut butter, why couldn't I just make peanut butter cookies and sub-out some peanut butter for nutella? No reason I could think of, so that is exactly what I did. You can probably do this with any peanut butter cookie recipe but this one from Simply Recipes makes a fairly small batch - a plus for us single ladies. Mix ingredients together to form dough. Roll dough into small balls, roll in additional white sugar and place on greased cookie sheet. Using a fork, press into each ball twice, making a cross-hatch design. Bake at 375 for 10 minutes. 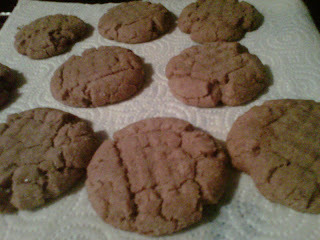 They will look a little darker than typical peanut butter cookies, so watch that they don't burn. While these were tasty, I feel like the peanut butter and nutella flavors competed a little bit with each other. In the next round, I might make all nutella cookies and see how that turns out.